Enjoy a Twilight and New Moon double feature along with a rare look at Twilight movie sets! 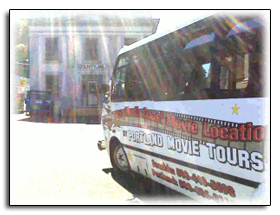 Portland Movie Tours will doing a special tour just for the Experience New Moon weekend. Watch the movie Twilight as your tour guides take you on a bus ride to movie sites rarely seen in Vernonia, OR. Then back to the Columbia Theater at 212 S 1st Street in St. Helens for a screening of New Moon. The small town of Vernonia was made over to be Forks, WA in Twilight. You’ll recognize many of the sites, including the old cobblestone Rock Creek Bridge that Bella and Charlie each drive over and the bank building used for the iconic Forks Police Station. Locals tell funny stories of the day they drove into town to find the “Welcome to Forks” sign and all of the buildings renamed for Forks businesses.